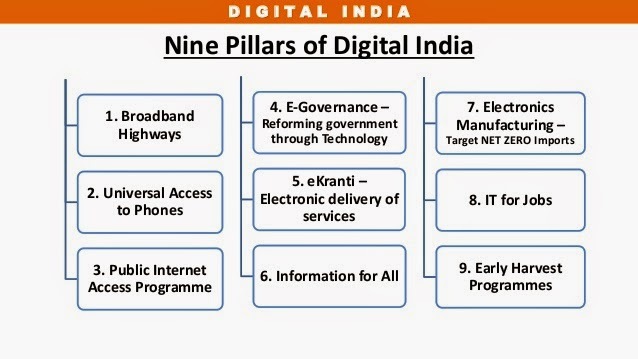 Blogged by Johri: Dreaming of a #DigitalIndia! #DigitalIndia is a dream that all Indians have seen. India's mainstay has been agriculture. Rural economy has been our strength. There has been a digital divide between the urban economy and rural economy. Now with e-Governance declared by the Government, we are on the path of bridging the gap between the digital divide and our Government is providing us the opportunities to do so through e-Governance. We all are with the PM's #DigitalIndia initiative which would make India a technology hub and Intel is also one of them. Intel is committed towards our government's vision of a Digital India. Through its ‘Digital Skills for India’ and ‘Innovate for India’ initiatives, Intel has been fostering technology as the enabler for creating a digitized India. Intel is committed to creating a digitally enabled India and believes that Innovation will drive this movement forward. E-governance through Technology can accelerate this vision of a digital India. Intel's educational app "Learn Digital Skills" teaches the basics of using tablets and is a venture towards making India digital literate. The app can be downloaded for free from the android store and is available in five Indian languages. 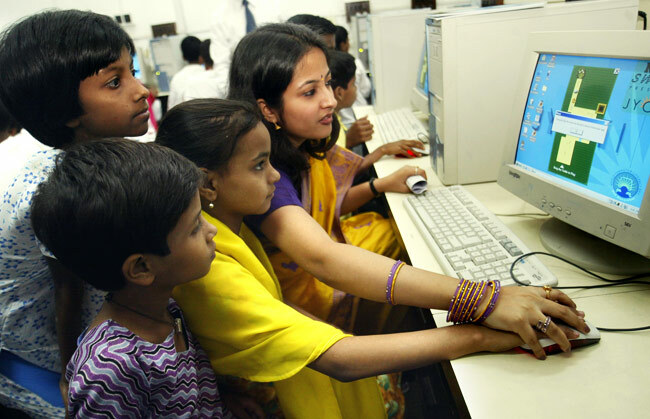 Social initiatives coupled with collaborative use of technology will plug the gaps in India's social development. Corporate Social Responsibility may be a main factor in #DigitalIndia programme. Government has declared many programmes to facilitate efficiency in governance including digital literacy and electronic delivery of services. E-governance is the core for creating the digital India. 1) Services being provided to Citizens, business, e-Transactions and future implementations as well to serve the society in a digitized manner and keeping one foot ahead on the journey of digital India. 2) Various Projects being implemented and initiatives taken for new projects. 3) Infra-structure being provided through State wide Area Networks/State Data Centre/Service Delivery Gateway/Common Service Centres etc. 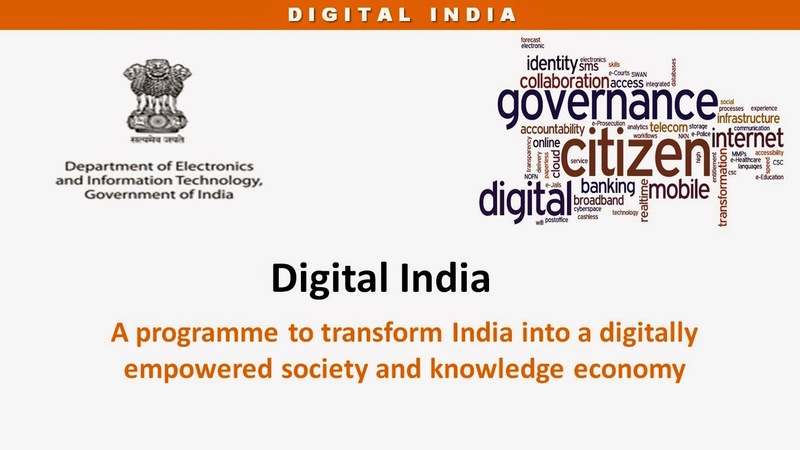 4) Knowledge and Skill development and its sharing amongst all in achieving the goal of digital India and its Collaboration through Knowledge Portal/Events/Gallery etc. 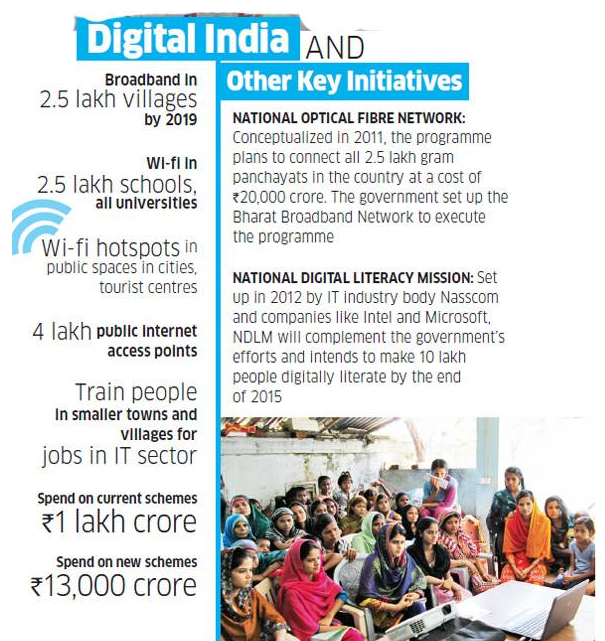 5) Information and communications technology (ICT) can play a vital role in the integration of telecommunications (telephone lines and wireless signals) and computers towards a digital India dream to be fulfilled. a) High speed internet as a core utility shall be made available in all Gram Panchayats. b) Cradle to grave digital identity – unique, lifelong, online and authenticable. c) Mobile phone and Bank account would enable participation in digital and financial space at individual level. d) Easy access to a Common Service Centre within their locality. e) Shareable private space on a public Cloud. f) Safe and secure Cyber-space in the country. a) Seamlessly integrated across departments or jurisdictions to provide easy and a single window access to all persons. b) Government services available in real time from online and mobile platforms. c) All citizen entitlements to be available on the Cloud to ensure easy access. d) Government services digitally transformed for improving Ease of Doing Business. e) Making financial transactions above a threshold, electronic and cashless. f) Leveraging GIS for decision support systems and development. b) All digital resources universally accessible. c) All Government documents/ certificates to be available on the Cloud. d) Availability of digital resources / services in Indian languages. e) Collaborative digital platforms for participative governance. f) Portability of all entitlements for individuals through the Cloud. 1) A strong support system. 2) A coordinated and transparent work approach. 3) Strong cyber laws to protect the information present online. 4) Eliminating the 'Digital Divide' and connecting each corner of the country digitally. If #DigitalIndia initiative is a success, every nook and corner of India will be well connected and information sharing will become easier with seamless integration between departments along with a stronger economy with a stronger knowledge base. Every Indian will be literate both digitally and alphabetically and in tune with the latest updates. This is a dream dreamed by every Indian and it requires our support to become a success! This post is written for the #DigitalIndia initiative and for the contest on Indiblogger in association with Intel.